1 Caption: The Persistence of Memory by Salvador Dali, 1931. Oil on canvas from the collection of the Museum of Modern Art, New York. 2 The image of a clock drooping over the side of a table is not a spectacle you would see in real life. You wouldn't want to rely on a clock like that to wake you up in the morning! This soft clock is in a famous painting. The painting has other odd clocks in it, too. This dramatic art style is called surrealism. 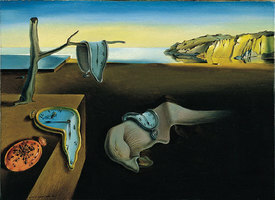 3 The odd painting with melting clocks is by an artist named Salvador Dali. It is called The Persistence of Memory. Salvador Dali was a leader in the surrealism movement, which included both artists and writers. It began in the early 1920s in Paris, France. Surrealist paintings are fun to study because they are so bizarre. The subjects are often realistic. However, they are shown in a perplexing way. Another Dali painting shows a giraffe with its back on fire. You would not want to see a giraffe like that in a zoo. Surrealist artists tried to surprise everyone. They often succeeded!